“What a transformational and healing experience! Thank you Maren and Kris! I stayed with Maren and Kris in San Marcos La Laguna, Guatemala for 8 days, I knew it was going to be a healing experience but it was so much more than that! You both welcomed me into your home and nurtured me during this process of internal transformation. You shared your healing tools; daily Kundalini yoga, healing cacao ceremonies, tarot reading, gong baths, music and singing, and invited friends and local traditional healing into my time there, like the magical Mayan Fire Ceremony and meeting Izaias & Izabel. “I stayed with Maren and Kris for 3 weeks in their magical place on Lake Atitlan. San Marcos itself had an incredible healing energy and it started my on a journey the moment I arrived. Maren and Kris hosted me in such a warm and comfortable setting where I felt completely accepted and cared for. I did a shamanic womb healing with Maren that was truly transformative. Not only did I overcome my life long fear of spiders during it, but I also came away feeling empowered to step into my power as a woman and weave my own story in this life - just like spider herself. 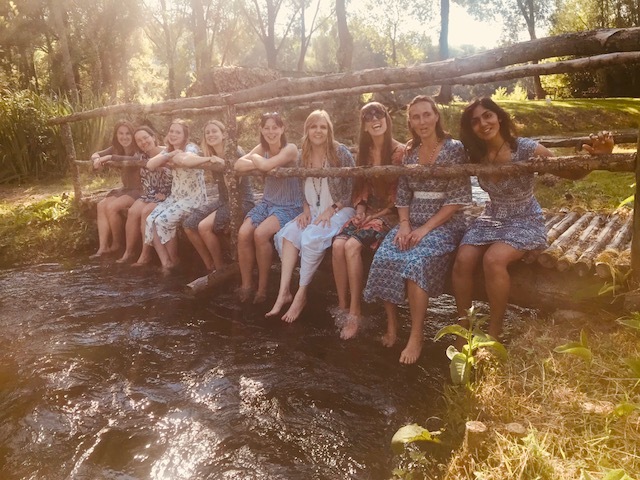 “I had the pleasure to come and stay with the beautiful spiritual warriors that are Maren and Kris Lander in Guatemala and had the most magical, transformative time in the most lovingly held safe space I could have asked for! I cannot recommend enough taking some time out and going to spend some time with these guys and how beautiful and life changing it truly was. Thank you so much to Maren and Kris for making me feel so loved and welcomed, like family, into a space where I was truly able to be myself and go through my process with so much love and support. ”Going to the women's retreat Maren held in NZ was life transforming, I had been spiritual most of my life, however through life and traumatic events lost my belief and closed myself off from this part of me. "The river still winds and I hear its call. It was cold as ice and it cleansed us all. We retreated into a place tucked far away. We let our light spill forth and passed our days. As I reminisce of our journey there. I recall the fairies, gnomes and mermaid fairies. Mother Mary surrounded us and we wept at her feet. The love in that space would be hard to repeat. It was special and magical and made us aware. Our life is worthy and valuable and we were made to care. We now step forth into the world of fire. Ready to douse the flames with love and inspire. I closed my eyes and am whisked away. To the river, the women and the journey that day. The day of water, light and carefree bare feet. The sun, the lake and the smiles so sweet. Even though our time had ended and we had to part ways. You will always hold a special place as I remember those days. Until we meet again dear Daughters of the Moon. Remember to care for your beautiful womb."